I've been getting lots of New Years Eve celebration emails. Last year I went to Jillians/Tequila Rain with a bunch of friends. This year, I'm considering laying low instead, but then I got an email about First Night Boston which may be worth checking out. First Night Boston is the country’s oldest and largest New Year’s arts celebration. On Dec. 31, 2009 from 1 p.m. to midnight, First Night presents a day-long festival of art, music, dance, ice sculpture, fireworks and more. First Night is an alcohol-free event that welcomes revelers of all ages to celebrate community and unity through the arts. 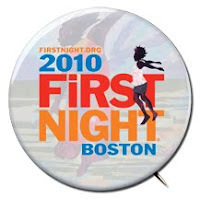 First Night 2010 will feature over 1000 artists in 200 exhibitions and performances in over 35 locations in Boston. First Night is proud to present an amazing group of performers and visual artists who truly represent the richness of Boston’s cultural landscape. Our celebration features longtime audience favorites like the interactive FedEx Family Festival, colossal ice sculptures, the Mardi Gras style Metro Grand Procession, the Boston 4 Productions Family Fireworks and the Frank Ward and Cape Dairy Midnight Fireworks, along with new and exciting performances and exhibitions. To enjoy the festivities you just need to purchase a button which are $18. Fireworks, a procession, live music, ice sculptures, and a whole lot more. The only part that scares me a little is that it's looking like it's mostly going to take place outside. And me and the cold don't get a long very well. 0 Response to "First Night Boston 2010 - 12/31"